Lyn just forwarded this link to me and I happen I have an bunch of left over chicken which I was going to make soup but this sounds interesting. I saw this recipe and the placement of the pan in the oven caught my attention, I like to marinate my birds in buttermilk, so I tried something close to this. 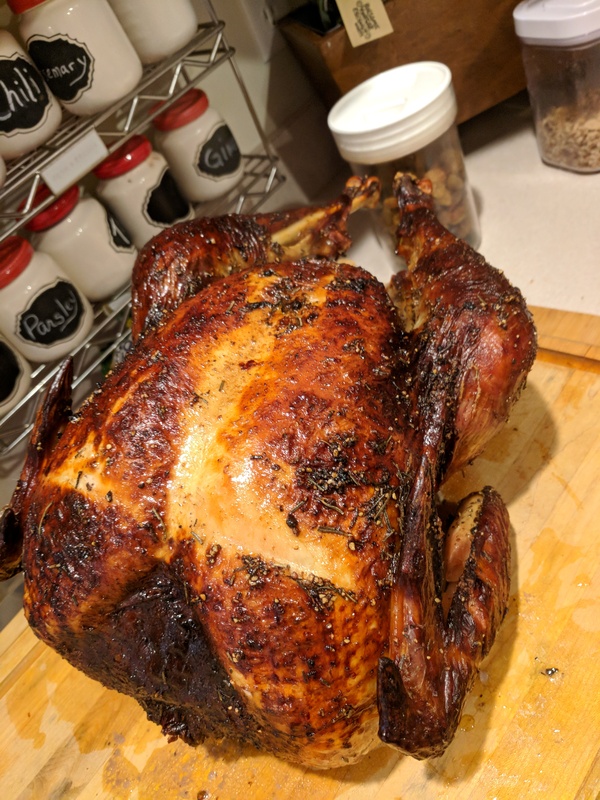 Thanks Samin Nosrat for the inspiration to try the cooking placement of pan method was well worth it, Lyn acutally brought it up again when Wholefoods had whole chickens on sale. 1 quart buttermilk, well shaken- I use the powered just add water kind, always have it handy love how this tenderizes chicken etc. 24 hours before you want to eat this chicken, salt inside and out with at least a few tablespoons, if not more. The reason is that much of the salt will get washed off by the buttermilk, so here you’re helping the inside of the chicken get seasoned. I wrapped in plastic wrap and placed in frig overnight. Place the chicken in a re-sealable plastic bag and fill the bag with the buttermilk. Seal it, squish the buttermilk all around the chicken, place on a rimmed plate, and refrigerate. Over the next 8-24 hours you can turn the bag so each part of the chicken gets marinated, but that’s not essential. When you’re ready to roast, preheat the oven to 475 degrees. Note: Next time I’ll place my cast iron or chefs’ pan in there so it gets piping hot. You hear the sizzle when you place the chicken on the pan. Remove the chicken from the plastic bag and scrape off as much buttermilk as you can without being obsessive. You can lightly rinse it if you want. Place the bay leaves, onion and lemon in the chicken’s cavity. Truss the chicken by placing a 12-inch length of butcher’s twine with its center in the small of the chicken’s back. Tie the twine around each wing tightly and then flip the chicken over and use the remaining twine to tie the legs together as tight as you can. Drizzle with a little olive oil, season with salt and pepper or alternative salt seasoning and place the chicken in the pan carefully to make sure the legs will fit as below described and the handle is towards you. Place the pan in the oven with the legs pointing toward the back left corner and close the door. You should hear the chicken sizzling pretty quickly. 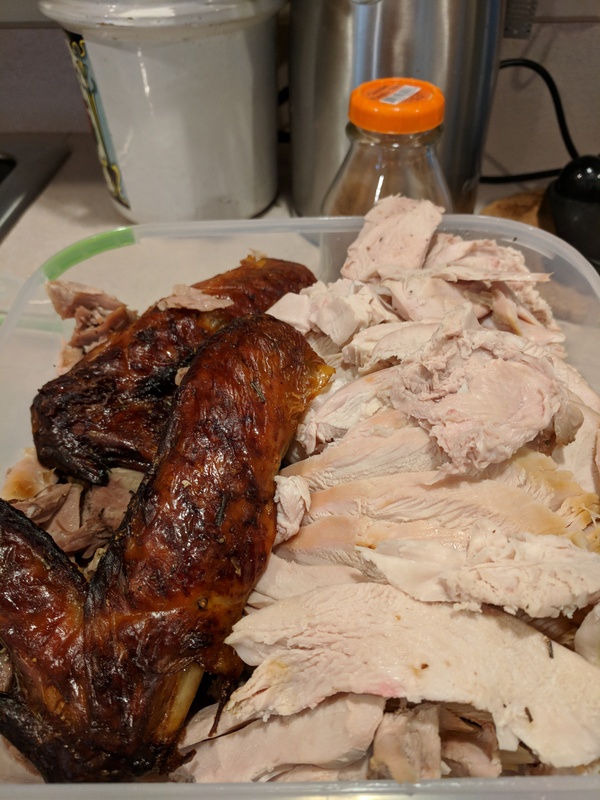 Roast for 15 to 20 minutes. 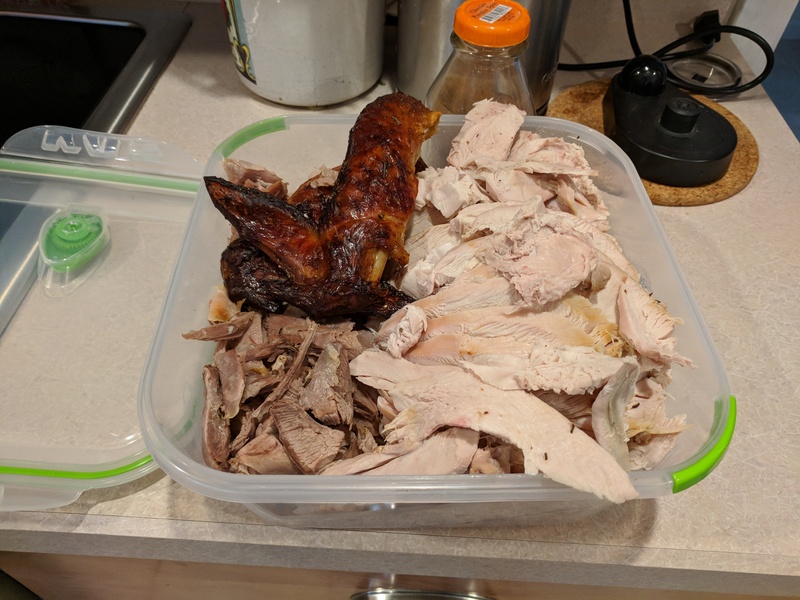 When the chicken starts to brown, lower the heat to 425 degrees and continue roasting for 30 minutes and then move the pan so the legs are facing the back right corner of the oven. Continue cooking for another 30 minutes or so, until the chicken is brown all over and the juices run clear when you cut between the leg and the thigh. If it starts to get to brown for your taste you can always make a loose tent with tin foil.